Time travel makes even motorcycle movies more awesome. Time travel is an opiate of mine. And so it came to pass that I watched a movie called Timerider: The Adventure of Lyle Swann on Netflix streaming. 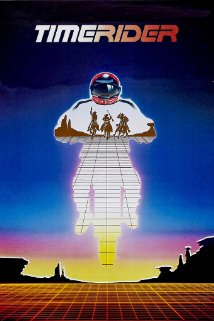 It was made in 1982, and the movie itself is a bit of a time machine. Powered by cheese. I learned from the opening credits that it was co-written and scored by Michael Nezmith. Cool, I thought, I wonder if I’ll see any influence from The Monkees. Then: OW, MY FRAMERATE. This opening motorcycle action sequence was shot in seizure-vision. Wait, now he’s off the bike, why is it still strobing at me??!? Was it just a problem with the video stream? It went on this way for almost the entire movie. Somewhere near the end I noticed it had been fixed, but I didn’t notice when it happened. There’s some good acting going on behind all the dated production. The opening scenes are a slow start by today’s standards—lots of motorcycle footage, peppered with a bit of cheesy dialogue characterizing the protagonist—but stick with it, it gets much better. The score includes some fun synth rock and also acoustic Western stuff that’s proven more timeless. Temporal prime directive! Spoilers follow. I really enjoyed the way that the time travel wasn’t obvious, how he spent most of the movie not knowing it had happened, choosing simpler explanations instead. This freed the story a bit, kept it from getting bogged down with explanations. And it was refreshing to see a protagonist that didn’t feel the need to cower at the threat of causality paradoxes. I don’t know if I was supposed to feel clever for seeing the necklace thing coming, but it was really like being hit over the head with a neon road sign. And then of course I have to spend some time in the mindblow quagmire of WHO MADE THE NECKLACE? And then eventually it will be so worn down as to fall apart. Then they’ll have to re-make it, or replace it. That must happen between 1875 and 1982. And if it does, does that mean it has to break and be replaced every time it passes through the loop? Et cetera. Bottom line: Fun flick, even if you find some of the production deserves the MST3K treatment. Also got me thinking how it might be different if it were rebooted today. This entry was posted in personal blog and tagged movies, time travel. Bookmark the permalink. Such a cheesy flick…but so much fun to watch, much like ‘The Dungeonmaster’. Not sure how this movie escaped me for so long. Apparently it’s better known than I thought, never having seen it before. Thanks for the review. I tried to watch this the other night, and the framerate and the cheesiness turned me off. I love Fred Ward, though. I’ll give it another go – without anyone susceptible to epileptic seizures in the room! Maybe they were trying to save money by only shooting 3 frames per second? It really *is* bizarre. Glad to know it wasn’t just me. I can only assume that yeah, it must have been a budget-related decision.